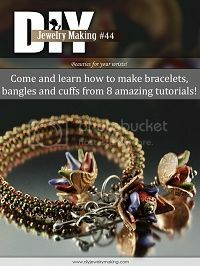 This is the PDF Digital tutorial for my original design, the "Rain Forest Flora" Bracelet. Take an imaginary trek through an Amazonian jungle and you’ll see the most interesting species of fauna and flora. The beaded portion of this bracelet reminds me of thick, heavy vines growing in abundance. One look at these colorful polymer clay tropical buds nestling inside bronze metal clay blossoms and I’m almost there! If you like immediate gratification, this is a fun mixed media project you can complete in a few days! The pattern containing easy to follow step-by-step instructions accompanied by large full-color photos.